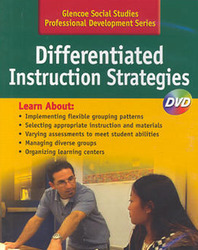 Differentiated Instruction Strategies—Learn about implementing flexible grouping patterns, selecting appropriate instruction and materials, varying assessments to meet student abilities, managing diverse groups, and organizing learning centers. Participants learn about the role of differentiation and its importance to student learning. They watch video commentary by teacher educator Nancy Frey, Ph.D. who discusses aspects of differentiation. Participants observe classroom lessons in which teachers use differentiated instruction strategies.